Smooth-casting and easy-handling, combined with plenty of knockdown power makes Abu Garcia's Ambassadeur 7000C3i Round Baitcast Reel ideal for drawn out battles with those fast-running big boys. Equipped with a chemical nickel-coated levelwind, aluminum spool, Carbon Matrix Drag, 2+1 stainless steel bearing system with instant anti-reverse, 6-pin centrifugal brake and a clicker. 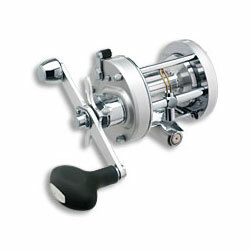 Weighing in at a mere 21 oz this high-performing reel has a line capacity of 17 lb./325 yards and a fast gear ratio of 4.1:1. "I've recently purchased two of these Abu Garcia 7000 C3i on Ugly Stik Tiger rods for catfishing. On my second trip I caught a 47# 43 inch blue catfish. I couldn't believe how smooth this reel was under the pressure of fighting this monster. Amazing drag!" "This reel is "the reel" when it comes to baitcasting. I have used ambassadeur mag series before and loved it. So I bought this one from this site. There is nothing at all to complain about. Everything is as it should be, even better."